Data handling process of Lüdecke & Weiss (2017). The first thing that jumps out from LW17 is the papers they cite in their introduction section. You can immediately see that their review of existing research is biased. They cite Scafetta but not his critics. They cite Svensmark but not his critics. They cite Friis-Christensen & Lassen but not their critics (even F-C & L themselves have later agreed that the findings they reported in the paper cited by LW17 were not correct). They cite lots of papers that suggest some kind of influence of the sun on Earth's climate, but they leave the multitude of papers that state clearly that sun hasn't caused current climate change almost un-cited. The methods section (sections "The Data" and "Spectral Analysis") of LW17 contains some curious issues. Perhaps the worst aspect of the methods section is that they haven't described all the methods they used. Their later sections contain many steps that haven't been described with enough detail in the paper, such as making a representation of the temperature reconstruction from the three sine waves and the steps involved in solar variability - temperature comparison. Another thing is how LW17 have adjusted the satellite data to HadCRUT4 data. They took 1979 values for each and then shifted satellite data so that their 1979 values were the same (I'm not 100% sure that they did it exactly like this - they don't give the details - but I think that the process I described results in what they did). I think using only one year worth of data to align the two records is a bad idea. It's especially bad because there was an El Niño in 1979-1980. El Niño generally shows up more in satellite records than in surface temperature records so using an El Niño year as a baseline creates a bias between the two records (the satellite record runs a bit low after this). I would have used several years of data to align the two records, 10 years for example. They also seem to use only one year data to align their source reconstructions together. LW17 have used temperature reconstructions from all over the world. This is good. They have also adjusted each reconstruction to a common baseline. This is also good. Their method to create a global data set out of them is a bad one, though. They have computed a simple mean of the reconstructions for each year. There is no area averaging or anything but just a simple mean. To illustrate why this is bad, they have only three reconstructions from the Southern Hemisphere (SH) while they have dozens of reconstructions from the Northern Hemisphere (NH) (making their reconstruction practically a NH one instead a global one). This means that the three reconstructions from SH are strongly out-weighted by the NH reconstructions. In a global temperature reconstruction both hemispheres should have an equal weight but in LW17 they don't have that, not even close. 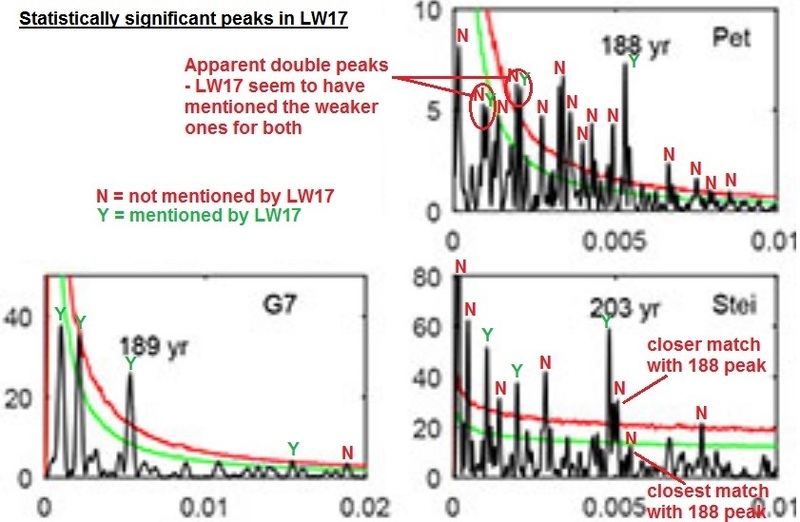 Making the SH-NH imbalance even worse in LW17, two of the three reconstructions from SH only cover time-period from 1640 to 1987 and from 1640 to 1993 while they describe their reconstruction as "a global temperature mean G7 over the last 2000 years". Furthermore, the only SH reconstruction covering the full 2000 years is an ice core based temperature reconstruction from Antarctica which has temporal resolution of 17 to 50 years while the NH records have annual resolution. Hence, most of the LW17 temperature reconstruction is lots of NH records + one bad resolution SH record. In their analysis, LW17 concentrate on cycles only and mainly to past climate, so the study has only little relevance to current climate change. Causes of past climate changes do not mean that greenhouse gases couldn't cause climate change now, and the presence of cycles in Earth's climate don't negate the effects of greenhouse gases, but climatic cycles and greenhouse gas forcing can (and do) co-exist. LW17 don't offer much new to sun-climate connection knowledge either because their main result is a possible correlation between the two which doesn't offer any information other than solar variability might have an effect on Earth's climate, which we knew already anyway. LW17 perform a Fourier transformation to their temperature reconstruction and then they select three strongest peaks from the Fourier transformation result. However, from their Figure 2 can be seen that one of the selected peaks (the 1000-year peak) is not statistically significant (it doesn't exceed what they call "false alarm line") while some of the statistically significant peaks (~65 year and ~50 year peaks) were not selected. LW17 do not discuss the issue. They just state that they have selected the three strongest peaks. Next, LW17 use the three selected peaks to do an inverse Fourier transform. The result of this is a representation of their original temperature reconstruction. This hasn't been described in the methods section, and they don't also describe it in the results section adequately. They only mention that they have done an inverse Fourier transformation. They compute a correlation between the original temperature reconstruction and the sine wave representation. Resulting correlation is quite good, but it doesn't mean much because they correlate an original series with a series that has been constructed from the original series. In practice, they just compute a correlation between two representations of a same signal. This would be okay if they would have just used the correlation to check that the temperature reconstruction from the three sine waves is a reasonably good representation of the original reconstruction, and then proceed with the actual analysis, but they seem to treat the correlation value as one of their most important results, and there’s no further analysis with the inverse Fourier representation. LW17 continue their analysis under the section "Sun's Activity and Climate". For many readers, it probably will not be a surprise that this section also contains problems. The Table 2 (T2) of LW17 claims to show "Strongest spectral peaks for the records Chr, Bün, McK, Vill-N, Vill-S, Pet, G7, and Stei for periods > 700 years, from 700 to 300 years, from 300 to 100 years, and < 100 years". From the figure above it can be seen that this is not the case. Highest peak of series "Pet" (ice core record from Antarctica) is very close to 0 (corresponding roughly to a wavelength of several thousand years) and the mentioned peak in T2 seems to be a double peak of which the weaker one seems to be better match in wavelength with the peak mentioned in T2. The mentioned peak of 499 years in T2 also seems to be a double peak and here better match seems also to be the weaker one. For both of the double peaks, it is of course difficult to estimate the situation from the graph, but it does seem that LW17 have selected the weaker ones of the mentioned double peaks to T2. The series "Stei" (the solar activity proxy series) also shows stronger peaks than the ones mentioned in T2. Above 700 years there are two peaks clearly stronger than the mentioned 991-year peak. Also from 700 to 300 years there is one higher peak than the mentioned one. The figure above shows also that it is easy to find matches for peaks when there are plenty of peaks to choose from. Highlighted is the selection of the peak in "Stei" that corresponds to the 188-year peak in "G7" (and in "Pet"). There are weaker peaks that are closer matches to the wavelength of 188-year peak than the highlighted 203-year peak. One of these is also clearly statistically significant at about 197 years. Moving on past the selection of solar activity peaks, it should be noted that after LW17 have selected the peaks, they don't do much about them. They don't construct a representation of temperature and calculate correlations or anything like they did for temperature series but instead they just mention that the solar activity "shows the same periods" as temperature reconstruction based on the values presented in T2. One further thing about the figure above, the solar activity series "Stei" shows lot of peaks and as discussed above, some of them are more meaningful than the ones LW17 emphasize. Why those peaks do not show up in the temperature reconstruction? This point has not been discussed by LW17. Next step is a very curious one. 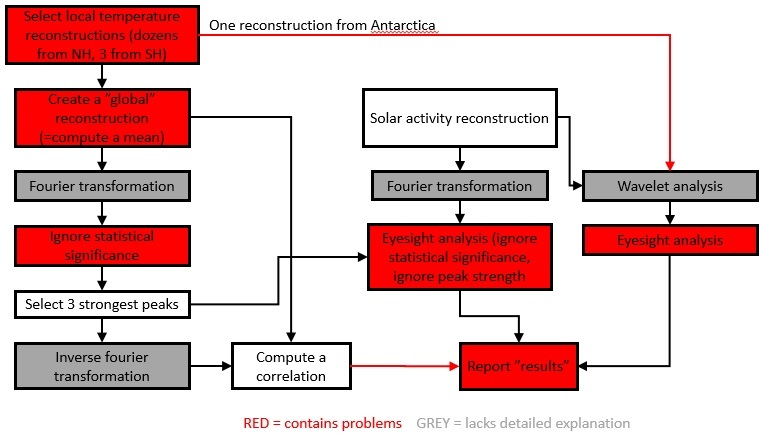 They proceed to check the solar-climate connection further, but for some reason they drop their temperature reconstruction G7 and start using "Pet" which is the low-resolution ice core proxy from Antarctica. They don't justify this at all. The method they use here is not described in detail. They only mention that they do a "wavelet analysis". At the end, however, their analysis here doesn’t extend beyond studying "eyesight similarities". In their introduction section, LW17 created a false picture of the situation of current research status of the solar activity - climate connection by citing mostly papers that support LW17 argumentation and ignoring most of the papers that show results against their argumentation. They did a not-even-half-baked analysis containing lot of flaws. In their conclusion section LW17 then suggested that their flawed results are a "confirmation" for the false picture created in the introduction section. We can also wonder what was the point of the Fourier-inverse Fourier exercise LW17 did (with subsequent eyesight "analysis"), because if you want to demonstrate a solar-temperature correlation, then why not just compute a correlation between them directly? It is curious that they didn’t do this at least as a side-note, surely it would (or should?) have been interesting also to them. In my opinion, LW17 is throughout bad science - biased citing, bad research methods, strange interpretation of results, etc. Having seen and studied the paper, I cannot help wondering what this quote from LW17 acknowledgements section means: "We express our thanks to the referees for valuable comments." If the referees gave valuable comments and the resulting paper still is as bad as described above, how bad was this paper originally? Sounds like LW17 is a study in confirmation bias not actual climate research based on actual data. Sure the Sun moderates climate on Earth, that is not the issue today. The issue we now all face is the virtually unrestricted release of carbon dioxide - the primary persistent GHG - from fossil fuels. It is simple to chart the increase in concentration of cardon dioxide in the atmosphere with a clear increase in averge yearly temperature as well as other clear indicators of a warming Earth such as changes in the timing of seasons, loss of global cryosphere, thermal expansion of oceans and more. And we can directly measure the increase of heat coming from the atmosphere in the spectrum that is absorbed by carbon dioxide, a plain fingerprint of the role that carbon dioxide plays in moderating the Earthès climate. Which is something we've understood with growing confidence since the early 1800s which culminated with a scientist in the late 1800s working out by hand what would happen if you doubled the atmospheric concentration of carbon dioxide. And who's results are still within the margin of experimental error. Even without quantum mechnical theory, over a century of data, computer models and highly sensitive instruments that were at best theory in the 1800s, Svante Arrhenius in the 1890s was still doing better science than these guys. Thanks again Skeptical Science for decoding intentionally generated bad science such as is represented by "work" like this. As for Bentham Open, how peer-reviewed is a journal that published an article that was generated by computer and submitted to test just how reviewed Benthan Open articles are. We should be going into the next glaciation, not because of the sun's output but because of the Milankovitch cycle. In fact if you read Ploughs, Plagues and Petroleum by Ruddiman, you see that snow and ice had begun to accumulate in the high lands of Baffin Island. Fortunately our output of green house gas reversed the process. It would have happened a little earlier but ploughing had released enough carbon into the atmosphere to slow the otherwise inevitable slide. The great plagues in the old world and the destruction of the native population in the new world by diseases brought by the Spanish caused a huge recovery of forests which was enough to just tip us over the edge to snow accumulation. Increased industrialization then came to our rescue. It is a shame we are using fossil fuels so extravegantly. If used judicially, we could completely avoid the next glaciation. Instead we may tip ourselves into a very nasty heating scenario, followed by a collapse of our civilization and a rapid draw down of Carbon dioxide as the forests and jungles recover. From a destructive heating we could then slide into the next glaciation. Ruddimans ideas are quite compelling. By some estimates we have already released more than enough CO2 to prevent or hugely delay the next ice age. We could still have a colder than normal period, but it only takes a couple of degrees to stop the full advancement of continent sized ice sheets. We don't need to release any more CO2. I gather the research in the main article deconstructs 200 yeas of solar irradiance data into its component curves and one of these correlates with recent decades of higher temperatures? But even if this is the case, which appears in doubt, a correlation doesn't prove a great deal by itself. Changes in solar activity like this don't appear to have much effect, and the overall recent decadal trend is falling solar activity. It's a question of relative radiative forcings acting on the Earth's land surface, oceans and atmosphere. The periods of deep glaciation in recent geological times that have covered a large part of the Northern Hemisphere in thick ice sheets and dropped global temperatures for thousands of years are likely the result of the Milanchovitch Cycles which can reduce the amount of Solar irradiation at northern latitude. These are on the order of a few tenths of a watt per meter squared and act over thousands of years in a dry process of more snow and ice cover lasting longer and reflecting more sunlight back into space dropping temperatures and drawing down more carbon dioxide cooling things even more creating more snow and ice cover which reflect more sunlight cooling things further. It's a feedback loop than when most of the continents are near the Equator can cover almost all of the Earth in ice. The radiative forcing from the changes we have made in atmospheric CO2 alone are almost +2 watts per meter squared, we have totally swamped the natural focrings that have resulted deep glaciation periods. There almost certainly will be no transition to a glaciation period due to the human release of CO2 alone. The Solar Cycles are also not that significant in relation to the forcings of atmospheric CO2 in recent times, once again in the range of a few tenths of a watt per meter squared. Even a prolonged Solar Minimum is not going to result in a cooling trend on the Earth's surface now, it will only result in a slowing of global warming as long as the positive radiative forcing from carbon dioxide emissions and other human activities greatly exceed the possible negative forcings from Solar Cycles. And the overall trend in Solar activity is not a decrease in Solar irradiance, it is an increase. The Sun puts out far more energy now than it did say 500 Mya for instance. Appealing to the Sun to save us as papers like LW17 do seem far more religious to me than scientific. OK, off subject - but Mods, is it at all possible to change the site coding so that one has to say right click on an "explained" link instead of the explanation appearing just because the mouse has lingered momentarily over the link? It's irritating to constantly have to cancel expanatory boxes which have appeared unwantedly! When you are logged on, you should see a tab on the lower left of your window that says "Look up a Term". Click on that, and you open up the glossary function. On the right, you can customize your settings. Unchecking all the boxes should stop any glossary terms from popping up. Many thanks - I hadn't seen that. The roguish curve-fitting in this LW17 paper will surely become more apparent the deeper you dig. I was intrigued by their use of HadCRUT4 and RSS (v3.3 as v4.0 was not published in April 2017) and their comment "For Bün, HADCRUT4 and Pet respectively the most recent years which show unusual deviations from the remaining reconstructions were also omitted." Perhaps this is why their Figure 3 makes such a poor showing at representing 20th century global temperatures. Their blue trace (31-year rolling ave, last data 2015) shows temperatures only reachng about 0.12ºC above the 1940s peak, about a quarter the actual value from HadCRUT4. And the final values plotted don't reach 2015 by a few years. Perhaps it was too painful to plot it all out properly as that would show their predictive red trace dropping 0.66ºC over the 75 year period since 1940 while the blue trace was travelling in the opposite direction by about the same amount. Such a mis-match looks to be unique on their 2000-year-long red-blue-dancing traces and, darn it, it is just at the point of interest. It must be very frustrating for curve-fitters when their curves refuse to cooperate!